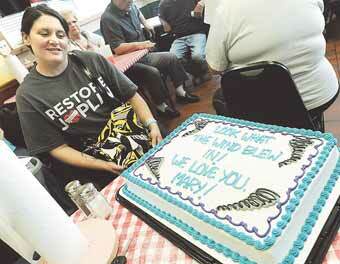 ~Joplin Globe~ Woman’s Scars Tell Story of Survival – Maggie's Popcorn and Nuts! May 22 was not Mary Burlingame’s day to die. On Saturday, she didn’t mind retelling her story during a surprise gathering of friends and family at the restaurant. As she told her story, she was calm and collected. There were no tears. The only evidence of her trauma were two scars on her face. Her worst injury, a severe wound to her back, was concealed. In addition to owning Curbside BBQ, her parents, Maggie and Bill Burlingame, own the Nutty Bavarian cart at Northpark Mall in Joplin, Mo. Mary Burlingame was managing the cart on May 22 when a security guard warned people to get to shelter. Unknowingly, she would drive into the path of the tornado. “I got to 20th Street, heading home to the 2400 block of South Joplin Avenue right behind the Salvation Army, and the traffic lights went out,” she said. She was excited to get home to bake cookies in her new kitchen. She and her father had worked three years to remodel her first home. They had installed the finishing touch — new countertops — the day before. “I was excited that when I got home I wouldn’t be living in a construction zone anymore, that life could get back to normal,” she said. She drove into heavy rain, slowing to a crawl because of poor visibility. “I turned onto Delaware, thinking that I’d avoid hail, and immediately saw the debris, a black cloud, roll in,” she said. “Then my car windows blew out, and I unbuckled my seat belt thinking I’d run for a ditch. But the door swung open, and I was pushed right out into a curb and along the street, and limbs were hitting me and power lines fell down around me. She asked the stranger if he could retrieve her purse and backpack from her mangled car — she knew she would need her identification — and a cellphone so she could let her parents know she was OK.
“He asked if I wanted my garage opener, so I said ‘yeah,’ not thinking my house would be gone,” she said. What Burlingame didn’t know was that she had a gaping wound in her back that was large enough to accommodate a woman’s fist. She made it to 20th Street and Connecticut Avenue, stopping each car she saw along the way, but none had room. Tawn saw to it that Burlingame got help in what had become a chaotic scene in the hospital’s emergency room. Her parents had been catering a high school graduation party at Curbside BBQ. They dropped everything and headed to Joplin. They made it to 32nd Street and Schifferdecker Avenue but could go no farther. Maggie Burlingame had been in a somewhat similar position before. On New Year’s Eve in 1985, she was working at the Joplin post office at First and Main streets when she went into labor. She delivered Mary Burlingame the next day — two months early — at Freeman Hospital. “That night, after the tornado, I told a nurse, ‘I brought her into the world at this hospital, and I will not let her leave the world here,” she said. Mary Burlingame said that during her treatment, the medical staff “pulled a chunk of wood, debris, gravel, leaves, parts of shingles” out of her back. “The pointer finger on my right hand was filleted open, my knee was open, and over 80 percent of my body had bruising on it,” she said. Mary Burlingame’s brother Charlie, boyfriend Kyle Raley and her mother bunked in her hospital room in sleeping bags for several days to give her the emotional support and care they thought she would need. No one told her about the loss of her home. Through it all, Mary Burlingame did all she could to learn the extent of her injuries, including asking physicians for photographs so she could see the wound to her back. “I wanted to know what was causing me pain and exactly what I was dealing with,” she said. She had three surgeries. Her back wound remains open. But by Saturday, she was strong enough to return home to Pittsburg. Before they left Joplin, her mother drove her through her neighborhood. “She just shook her head and said, ‘Mom, I don’t know how anyone could have survived this,’” Maggie Burlingame said. Maggie Burlingame’s longtime friend Jonelle McMurry was one of several who gathered to welcome Mary Burlingame home Saturday. Mary Burlingame’s plans are uncertain, but she’s fine with that.